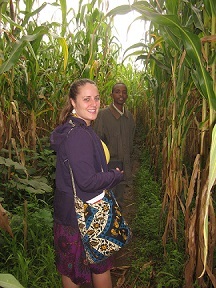 I had the opportunity to work with Dr. Ernst and her team in western Kenya this past summer. I conducted a qualitative research study entitled, "Using the Positive Deviance Approach to Identify Community-Based Solutions to Malaria Prevention in Western Kenya." With the help from community health workers, local nurses, and field assistants from Dr. Ersnt's project, I interviewed 24 families with histories of strikingly low- (N=12) and high- (N=12) incidences of malaria and extrapolated key themes and trends among the two groups. Any community-based solutions to malaria prevention will be recommended to local governmental and nongovernmental organizations. Chinagozi Ugwu conducted verbal autopsy study in several communities in Enugu Nigeria. The purpose of the study to assess the use of this epidemiological tool in identifying causes of early infant mortality among study participants enrolled in the Healthy Beginning Initiative. BACKGROUND: Nigeria has the highest number of number of neonatal deaths in Africa and second highest in the world. Most of the deaths are thought to be caused by preventable and treatable diseases. However, causes of death are not investigated because of unavailability of medical autopsies in resource-limited settings like Nigeria. In such settings, verbal autopsy is a valuable tool for assigning probable causes of death. OBJECTIVE: To assess the feasibility of using the World Health Organization (WHO) standard verbal autopsy (VA) questionnaire for identifying probable causes of neonatal and post-neonatal death in a community-based setting in Enugu, Nigeria. DESIGN: Cross-sectional study nested under the Healthy Beginning Initiative (HBI), a randomized control trial examining the uptake of HIV testing during pregnancy when conducted during a baby shower. Participants who experienced neonatal and post-neonatal death after enrollment into the study were identified. VA interviews were conducted with close relatives who provided care to the deceased using the WHO VA questionnaires, in Igbo language, Pidgin, English per participant preference. Interviews were conducted in June and August 2014. RESULTS: A total of 49 neonatal and post-neonatal deaths were assessed. The medium age of mothers who experienced infant loss is 31(±5.31) years. Infections, 31%, such as neonatal pneumonia were related to a significant number of neonatal death. Neonatal death were mainly caused by malaria, 36%. Issues affecting feasibility of implementing the tool and solutions offered were categorized into four axes: data collection, logistical, cultural acceptability. CONCLUSION: Implementation of verbal autopsy is feasible in the HBI population.